The SQL TRUNCATE Table Statement is used to remove all the records from a table, or specified partitions of a table. The Truncate table in SQL Server is similar to the Delete Statement without Where Clause. Before we get into the practical example, let us see the syntax behind this SQL server Truncate table statement. Database_Name: Please specify the database name that contains the table. Schema_name: Please specify the name of the schema to which our table belongs to. The Truncate Table statement uses less transaction when compared to its counterpart DELETE Statement. Because, this statement deallocates the data pages used to store the records/data, and the transaction log will store these page deallocations. Truncate table performs locking at the table level (which is faster) but not on each row. After you apply SQL Truncate table statement, zero pages will be left in the table. If the table contains an identity column, the counter for that column will be reset to the first value. For example, we have ID INT IDENTITY(1, 1) which contains 100 rows/records, and we performed TRUNCATE table on ID. This truncate statement will delete all the records from ID, and reset the IDENTITY to 1. TIP: The SQL Truncate Table statement removes all rows from the specified table, but the table structure, constraints, columns, indexes will remain the same. 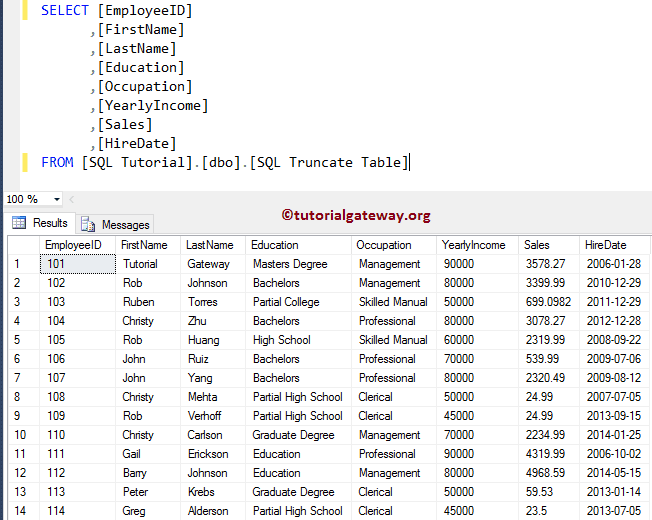 In this article, we will show you, How to write SQL Server Truncate table statement. From the below screenshot you can observe that, We have [SQL Truncate table] table in the [SQL Tutorial], and the table holds 14 records. 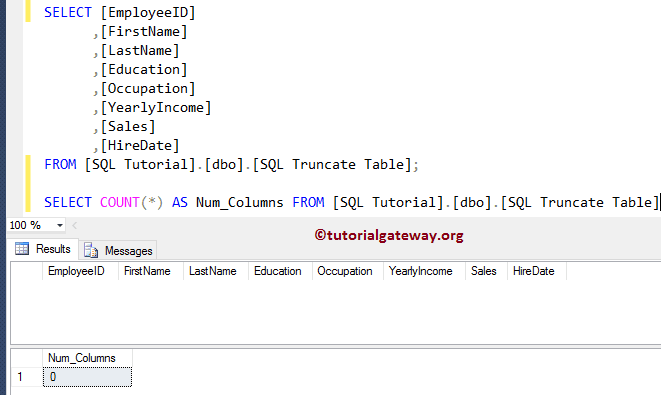 In this Sql Server truncate example, We are going to truncate the above-specified database Table.